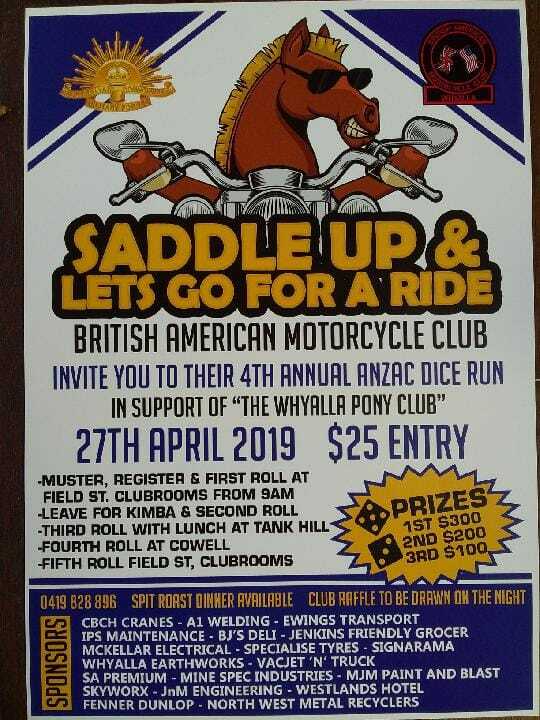 BRITISH AMERICAN MOTORCYCLE CLUB Presents their 4th ANNUAL ANZAC DICE RUN on the 27th APRIL 2019 in Support of THE WHYALLA PONY CLUB. SADDLE UP AND LETS GO FOR A RIDE. Muster and Register at Field st Clubrooms from 9.00am. $25 Entry. Prizes for 1st,2nd and 3rd. Spit Roast Dinner at Clubrooms after ride. All Welcome.